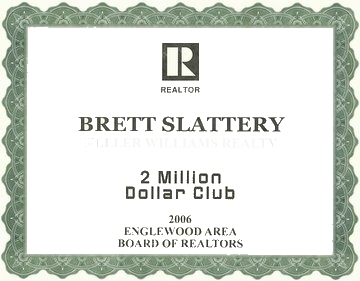 Why choose Brett to be your Realtor? Actions speak much louder than words. So instead of promises, I will use this page to show you what I've been doing for my clients. As you will see, many of the marketing techniques I have developed are innovative. Some are completely unique. Florida Realtor magazine has noticed this. This prestigious journal is published by The Florida Association of Realtors for distribution to Realtors throughout the state. 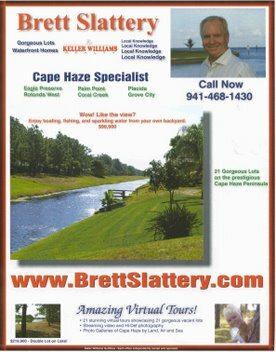 Florida Realtor magazine has paid me the ultimate compliment by featuring me in separate stories focusing on "Over The Top Marketing Strategies" and "Sky High Service". During season, buyers commonly cruise through your neighborhood looking for homes. You only have a few seconds to grab their attention. To accomplish this, I often create my own signs to dramatize the features that set your home apart. If needed, I'll fly over your home to accomplish this. 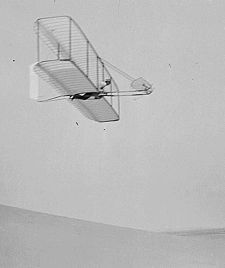 When you list with me, expect me to go to great lengths to market your home using every tool available, including boats, planes, and tower trucks. It takes a combination of an ex-telephone repairman and Realtor to fully appreciate the power of a tower truck to market your home. Incredibly, the right tower photo can add thousands of dollars to your properties value by uncovering 2nd and 3rd floor views that many owners are unaware of. 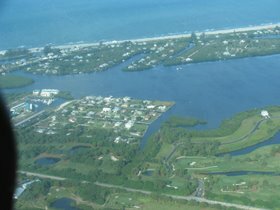 Cape Haze, Palm Point, and Eagle Preserve are good examples. I go to great lengths to demonstrate the value of your property when you enlist me to market your property. There are some situations where the only proper way to dramatize your property is by conducting an aerial photo shoot. I use planes not only to market homes, but entire neighborhoods. 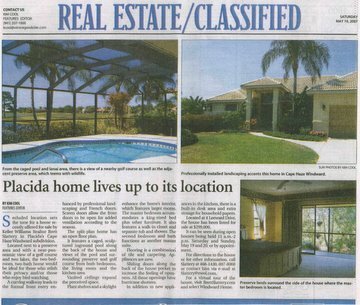 Most people assume you must pay big bucks to publicize your home in newspapers. 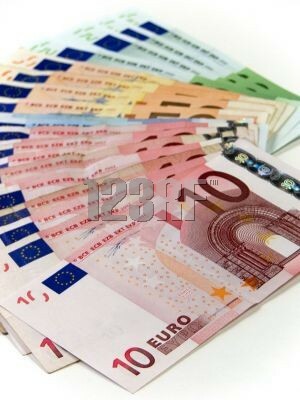 However, the most valuable advertising available can not be bought at any price. For example, Kim Cool writes a "featured home" column for 6 major newspapers that appears once a week. The odds of having your home featured is less than 1 in 10,000. During the past 24 months, 3 of my listings have been the subject of her front page feature stories. Two of the homes sold within a week of publication. If your home is special, count on me to insure the world knows it. Click here for more info. When you list with me, your home is automatically registered with "Realtor.com". 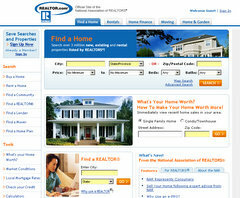 "Realtor.com" is the most visited real estate web site in the world. That means that, in addition to local and statewide exposure, your home will receive global exposure. This is highly advantageous to any seller in Southwest Florida since a high percentage of our buyers begin their web searches from their homes other states and countries. Click here for more. There is an important distinction between a "real estate agent" and "Realtor". As a licensed Realtor, I am sworn to obey a strict code of professional ethics that transcends the basic requirements imposed on "agents". I enjoy a special relationship with "Realtor.com" that entitles me to "enhance" your listing on "Realtor.com". Ordinarily, "Realtor.com" only allows a single picture and a canned description for each listing. I am authorized to include 25 pictures, a virtual tour, and even video to your listing. This causes your listing to rise near the top of the search results. The quantity of high resolution photos and presence of a virtual tour provides a hook to attract buyers as they race through listings. Click here for more. According to NAR, 77% of all buyers, begin their property search on the web. Although Realtor.com is the first choice, many buyers turn to other search engines such as Google, Trulia, and HomeGain. I have partnered with these search engines and many other major engines to insure that your listing pops up on these search engines. This is no small feat. But the rewards are great since there is a direct connection between the exposure your home receives and how quickly it sells. Click here for more. People are visual. NAR (National Association of Realtors) statistics indicate that potential buyers overwhelmingly focus on listings that include photos. I capitalize on this by including the maximum number of photos allowed into each listing service such as the MLS and "Realtor.com". Most buyers sort by "Number of Photos". This causes your listing to appear near the top as buyers search for homes that meet their criteria. Stacking your listings with the maximum number of photos allowed increases your exposure. But to further entice buyers, I have invested $4,000 in professional quality photo equipment to insure that every picture showcases your home in it's best light. For example, I use a flash beam to bounce the light off your ceiling. This provides even light distribution, eliminates shadows, and brings out the true colors of your home. Buyers appreciate detail. A virtual tour is a web site dedicated to showcasing your home with photos. I create a virtual tour for every home I list, and even vacant lots. Why? Buyers and Realtors are much more likely to explore a listing that includes a virtual tour. Most property descriptions are laden with clichés that do not depict the true beauty of a home. On the other hand, buyers trust pictures. 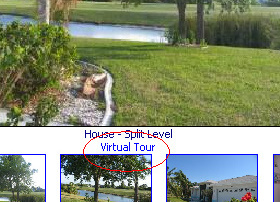 They'll spend much more time exploring a property showcased with a virtual tour. In fact, some buyers tend to ignore listings that apparently are not worthy of a virtual tour. To view my virtual tours, click Home, then scroll down to "Featured Properties". Although virtual tours attract buyers, very few live up to their potential to excite the buyer. The vast majority are created from the same industry templates. They crawl. Pictures are grainy. Elevator music plays. Photos slowly fade in like you've got all the time in the world. To resolve this, I created my own virtual tour company combining leading edge technologies such as streaming video to showcase your home at a pace that is fast, snappy, visually exciting, and respectful of the buyers' time. The result is that buyers complete your tour and are fully exposed to everything your home has to offer. Click for sample. 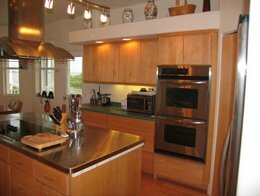 I spend considerable time creating a description of your home that capture's it's uniqueness. 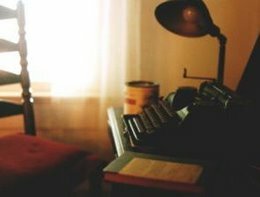 I do not use clichés because buyers are desensitized to them. In the spring of 2007, I listed a home reminiscent of Japanese architecture. In the MLS description, I noted the architect's generous use of windows created intriguing angles of light that formed a perfect setting for hanging gardens. The home sold quickly. The buyer's agent reported his buyers had recently resided in Japan and became interested in the home based on the description. That's the power of words. Year 2006 and 2007 have been rough years for the real estate industry. However, due to hard work and innovative marketing, I was awarded "multi-million producer" status in 2006, and achieved the same status the first 6 months of 2007. It's takes a lot more work to sell a home today then it did prior to 2005. I am proud to say I have a proven track record as a multi-million dollar producer, even as we face the toughest buyer's market in 16 years. When you list with me, you are hiring someone with a proven track record. High elevation can reduce construction and insurance costs. Proximity to a fire station or hydrant can also reduce insurance premiums..
Oak trees add immediate and resale value. In Rotonda West, lots increase in value as you move clockwise around the circle due to newer homes. Abutment to public lands creates privacy in perpetuity. Canals can be a source of free irrigation water. Click here to see how hard I work to identify and market the characteristics that make your property special. I know the area. I have lived and worked on the Cape Haze Peninsula since 1994. I love it here. 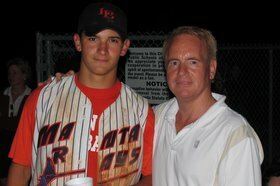 I raised my son here. My enthusiasm for our community is contagious because it's genuine. My involvement in the community as a businessman, Realtor, parent, and civic leader has given me in depth knowledge of our area, equipping me to address any questions or concerns a buyer may have. For example, a couple out-of-town buyers recently expressed concern about mooring for their large boat. That was easily overcome by driving them to nearby marinas. I do lots of homework. I publish my research in my business column which runs on the front page/business section of 6 regional newspapers in southwest Florida. My on-going research of the real estate market provides me with in-depth, and sometimes unique insights, into the dynamics of our market. This equips me to serve you as both a Realtor and consultant. This also benefits you in less obvious ways. 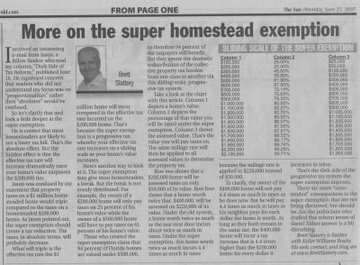 For example, each of my columns end with a link pointing to my web site; the same site I use to market your property as a "Feature" home, thus increasing the exposure of your property to a circulation peaking at 100,000 readers. In addition to writing a syndicated real estate column, I maintain a high degree of involvement in local affairs. Although my motivation has been public service, the information I acquire puts me in a better position to serve you as a Realtor by acquiring knowledge sometimes not available to the public. My recent service includes a 3 year, elected term on the Rotonda West Board of Directors, and 1 year as Vice President. 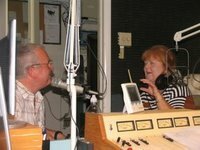 My current projects include speaking engagements to civic groups and radio audiences to educate the public on tax reform. Pricing your home correctly is essential. Most properties today are overpriced. That's while the market is in gridlock. Actually, it's not in total gridlock. In Windward alone this year, 11 homes have sold. I listed 3 of them, and sold two. They sold because we priced them right. That is part of my job when you hire me to list your home. 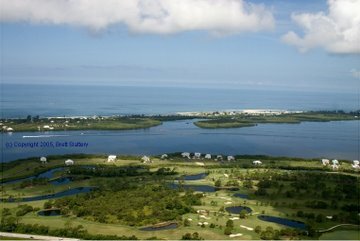 A short distance away in the Cape Haze waterfront community of Palm Point, only one Realtor has successfully listed and sold home there. That was me. It was my own home and I priced it sell in 6 weeks. It didn't take that long. When you list with me, we'll price your home to sell. 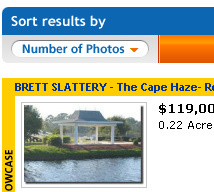 Above: According the MLS, Brett Slattery is the only Realtor who has sold a home in Palm Point during 2005, 2006, and 2007. Click here to find out why. As your Realtor, I'll go to great lengths to serve you. For example, last winter a couple asked me to find them a larger home in their area. They knew exactly what they wanted, but there were no homes on the market meeting their criteria. I researched county records and found 12 homes that met their criteria, but were not for sale. I contacted all 12 owners, and found one willing to sell. I negotiated the sale and also completed the sale of the first home. This took tenacity, but that is what you should expect when you allow me to serve as your Realtor. Florida is an international destination for visitors and home buyers. 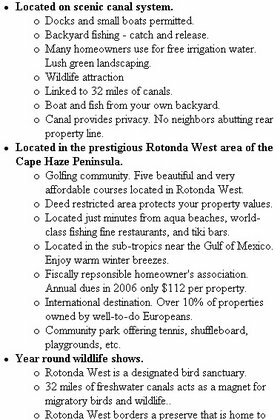 For example, 12% of all Rotonda West properties are owned by non-US residents. This is huge. Yet, very few of my associates market internationally due to barriers such as time zone lag, high postage rates, notary challenges, and FIRPTA laws, etc. So why do I buck the trend by pursuing these markets? The decline of the dollar against the Euro and Canadian currency presents a wonderful buying opportunity for our friends outside our borders. The effort pays off. During the past 6 months (as of 09/18/07, I have bought and sold homes and lots for clients from Canada to the UK. When you list your home with me, rest assured the world is going to know about it. Technology is reshaping the real estate industry daily. If you've read the previous entries here, you know I take full advantage of all emerging technologies to maximize your home's exposure and appeal. Some of the technologies I implement are not very exciting, but they allow me to provide you with an exceptionally high level of service. 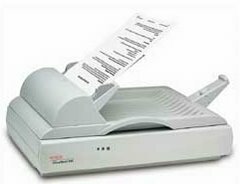 For example, instead of faxing you documents (which are difficult to read), I use high speed scanners to convert them to high resolution PDF files which can be emailed to you instantly, and printed with degradation in quality. This technology enables me to bring buyers and sellers together in real time, rather than the speed of faxes, snail mail, or even Fed-Ex, regardless of where in the world they are. 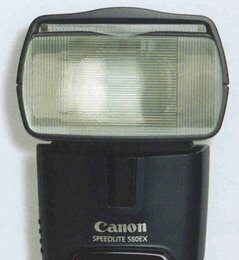 This high speed scanner enables me to email you any document in full resolution. As a licensed Realtor, I have direct access to MLS systems. When I enter your listing into the MLS system, it becomes visible to every Realtor in the area, as well as every buyer surfing the public MLS web sites. Direct access means I can create or change your listing in seconds. Entering your listing into the MLS system is the number one thing you can do to increase it's exposure to buyers and other Realtors. A "pocket" listing occurs when an agent takes a listing and keeps it to himself hoping to make both (listing and selling) ends of the commission. I don't do that. I am a "cooperating" Realtor. When I list your home on the MLS, I pledge to split my commission with any Realtor who brings us a buyer. When you hire me to list your home, you are engaging the services of thousands of Realtors cooperating with me to sell your home. 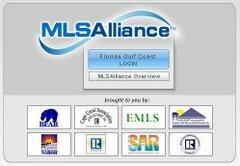 In addition to the local MLS system, I enter your listing into an a state-wide network of MLS systems known as MLS-Alliance. This further extends your listing's exposure to 27 other MLS boards throughout the state of Florida. That means if a Realtor in Miami, for example, has a client looking for a home in your area, your listing will pop up on the search results. This benefits you because many Realtors rely solely on the MLS-Alliance system to find clients a home outside the Realtors own area of expertise.